Part 1 Developments in high temperature corrosion: Diffusion and solid state reactions; Transition between external and internal oxidation of alloys; Modern analytical techniques in high temperature oxidation and corrosion; Metal dusting corrosion of metals and alloys; Tribological degradation at elevated temperatures; Hot corrosion of alloys and coatings; Oxide scales on hot-rolled steel strips. Part 2 Developments in protective oxide scales and coatings: High-temperature corrosion mechanisms in layered ternary ceramics; Formation and growth of protective alumina scales; Oxidation of Ti-Al intermetallic compounds; Oxidation of metal matrix composites; Design strategies for new oxidation-resistant high temperature alloys; Oxidation behaviour of chemical vapour deposited silicon carbide; Oxidation resistant nanocrystalline coatings; Thermal barrier coatings. Part 3 Case studies: High temperature corrosion problems in the petrochemical industry; Oxidation processing of electronic materials; Corrosion in modern incinerators; Sulfidation of metallic materials. High temperature corrosion is a phenomenon that occurs in components that operate at very high temperatures, such as gas turbines, jet engines and industrial plants. Engineers are constantly striving to understand and prevent this type of corrosion. This book examines the latest developments in the understanding of high temperature corrosion processes and protective oxide scales and coatings. Part one looks at high temperature corrosion. Chapters cover diffusion and solid state reactions, external and internal oxidation of alloys, metal dusting corrosion, tribological degradation, hot corrosion, and oxide scales on hot-rolled steel strips. Modern techniques for analysing high temperature oxidation and corrosion are also discussed. Part two discusses methods of protection using ceramics, composites, protective oxide scales and coatings. Chapters focus on layered ternary ceramics, alumina scales, Ti-Al intermetallic compounds, metal matrix composites, chemical vapour deposited silicon carbide, nanocrystalline coatings and thermal barrier coatings. Part three provides case studies illustrating some of the challenges of high temperature corrosion to industry and how they can be overcome. Case studies include the petrochemical industry, modern incinerators and oxidation processing of electronic materials. 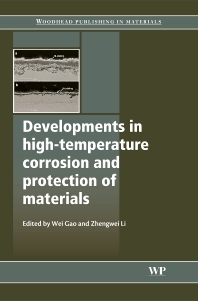 This book is a valuable reference tool for engineers who develop heat resistant materials, mechanical engineers who design and maintain high temperature equipment and plant, and research scientists and students who study high temperature corrosion and protection of materials. Wei Gao is a Professor of Materials Science and Engineering and a Fellow of the Royal Society of New Zealand. He and his colleague Dr. Zhengwei Li, a Senior Research Scientist at the University of Auckland, have been heavily involved in research into high temperature oxidation and corrosion theories, testing and the development of protection techniques and coatings for industrial applications.